If I could describe this movie as an object, I would call this film wallpaper. Or, if I were to describe this movie as something more abstract, I would call it white noise. Since the cinematography imitates the yellow color scheme of Gustav Klimt’s paintings, I call this movie yellow noise. So, Gustave Klimt. In this movie, do we see him as the controversial rebel? Do we also see him act as a leader of the Viennese Secession? Not really. By the way, how do you have John Malkovich playing Gustav Klimt and still screw up a film? Bad writing, of course. This movie depicts Klimt in a coma (similar to this plot), and remembering the last years of his life in flashback. During these flashbacks, he spends most of the time hypnotized by then new technology, and talking. However, he does have some good scenes where he rails against critics and insulting people. There, Malkovich makes this movie somewhat engaging. However, the rest of this movie consisted of nothing but wasted potential. 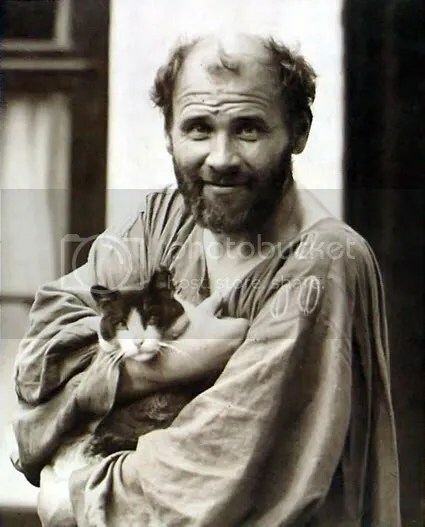 Klimt once said that he did not consider himself an interesting person (1) and this movie seems to agree. Image via Photobucket and lolozano7. In the words of Mike Nelson from Mystery Science Theater 3000, “I think they forgot to have things happen,” Nothing happens in this movie. At all. This movie has only pretty scenes and nothing else. Oh, they talk about the Vienna Secession and his controversies, but they do not expand upon these things. For example, we see Klimt with his mother and sister having a meal. After he leaves, they both have a fit of screaming. Plus, the movie never features them again, rendering them pointless. As someone who has had art history professors tell me to expand upon subjects in papers, this angers me. Speaking of the other characters, I found them forgettable, and that included his friend Emilie Floge. At least in Goya’s Ghosts, the events play out wonderfully in a grand scope. In Nightwatching and Love is the Devil, the movies play out events of the artist’s life that let you contemplate them. They had a slow pace, but they did not leave me bored. Also, this movie seems to think that Klimt suffered from seeing imaginary people. From what I have read, I have never heard of Klimt having this problem. Furthermore, the way they depict his death? Ugh. His death scenes consist of him seeing snow falling in the hospital. Really? No mention that he died of pneumonia? However, the good things I do like come from the Viennese costumes and the yellow cinematography seen reflecting Klimt’s use of color. Regarding tropes, I did not like this movie, so I am not going to go into that. 1. Kransel, Nina, Gustave Klimt, Prestel, (Munich, 2007) 47. After reviewing this movie, I realized I missed out on other people’s reviews of this film. After all, maybe they caught something that I did not. From the New York Times: Klimt: Portrait of a Ladies Man Stephen Holden makes some very good points about this film (in fact, he made some of the same complaints I made). Also, he comments that the whole story came from Klimt’s mind while he was in a coma. This does explain the hallucinations Klimt saw, thus invoking the Unreliable Narrator. However, the hallucinations still left a bad taste in my mouth. Furthermore, Holden mentions a longer director’s cut. I plan on obtaining that version because I want to give this movie another chance. From the Chicago Tribune: ‘Klimt’ more like essay than biopic. Alan Artner provides analysis to the director’s (Raul Ruiz) style and interpretation of Klimt’s life. By the way, check out more reviews from Rotten Tomatoes. Note: Some of the links do not work. ETA 6-7-17: Removed a photo.